Maria Beadnell, the daughter of a banker, was born in 1810. She had two sisters and an elder brother who was a lieutenant in the army. Little is known of her early life but in May, 1830 she met Charles Dickens. He was eighteen and she was two years older. According to Peter Ackroyd: "She was quite short... dark-haired, dark-eyed with the kind of slightly plump beauty which can so easily dissolve in later life; and from all the available evidence, she was something of a flirt if not quite a coquette." Dickens fell in love straight away but Maria's parents disapproved of the relationship. Andrew Sanders, the author of Authors in Context: Charles Dickens (2003), has argued: "Despite Dickens's infatuation, and a flood of bad poetry addressed to her, the coquettish Maria proved to be non-committal about the relationship. It is possible that her father had caught wind of John Dickens's earlier embarrassments, or that he considered Charles's economic and professional prospects unsatisfactory." Maria's father was a senior clerk at the bank at Mansion House and considered himself well above the Dickens family financially. 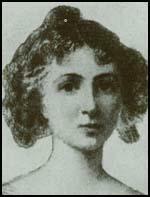 In 1832 the Beadnell's took action to end their daughter's flirtation by sending her to Paris. Dickens wrote a letter, telling her, "I never have loved and I never can love any human creature breathing but yourself." Dickens did see Maria when she returned to London but it was clear that she did not return his feelings for her. Dickens wrote to her accepting defeat: "Our meetings of late have been little more than so many displays of heartless indifference on the other hand while on the other they have never failed to prove a fertile soil of wretchedness in a pursuit which has long since been worse than hopeless." He also returned her letters and a present she had given him in happier times. Dickens told John Forster that his love for Maria "excluded every other idea from my mind for four years... I have positively stood amazed at myself ever since! The maddest romances that ever got into any boy's head and stayed there". However, he added that Maria had inspired him "with a determination to overcome all the difficulties, which fairly lifted me up into" becoming a writer. Maria remained unmarried until, at the age of thirty-five, she became the bride of Henry Winter, a saw-mill manager in Finsbury. Over the next few years she had two daughters. In 1855 Maria wrote to Charles Dickens. The letter was later destroyed but Dickens's letters in reply have survived. In his first letter to Maria he wrote: "Your letter is more touching to me from its good and gentle association with the state of Spring in which I was either much more wise or much more foolish than I am now". In his second letter he told her that he had "got the heartache again" from seeing her handwriting. "Whatever of fancy, romance, energy, passion, aspiration and determination belong to me, I never have separated and never shall separate from the hard hearted little woman - you - whom it is nothing to say I would have died for.... that I began to fight my way out of poverty and obscurity, with one perpetual idea of you... I have never been so good a man since, as I was when you made me wretchedly happy." Dickens wrote another letter to her claiming their failed relationship changed his personality. The "wasted tenderness of those hard years" made him suppress emotion, "which I know is no part of my original nature, but which makes me chary of showing my affections, even to my children, except when they are very young." Dickens suggested they met in secret. She agreed but warned him she was "toothless, fat, old, and ugly", to which he replied, "You are always the same in my remembrance". Gladys Storey has argued: "Mrs. Winter dined with Dickens and his wife at Tavistock House. He beheld her as she was - no longer the girlish Maria Beadnell, as in some extraordinary way he had expected to find her. In a flash the past vanished and with it - so far as Mrs. Winter was concerned - his youthful dreams. Yet something had been awakened within him; a something which remained peculiarly, unconsciously expectant of some fulfilment." As Claire Tomalin , the author of Dickens: A Life (2011) has pointed out: "The meeting took place. He saw an overweight woman, no longer pretty, who talked foolishly and too much. The edifice he had built up in his mind tumbled, and he beat an immediate retreat. There was, however, a dinner with their two spouses, which allowed him perhaps to compare the appetites and girths of Maria and Catherine and brood on their resemblances." Maria Beadnell was the model for Dora Spenlow in David Copperfield (1850) and Flora Finching in Little Dorrit (1855). Maria Beadnell Winter died in 1886. Our meetings of late have been little more than so many displays of heartless indifference on the other hand while on the other they have never failed to prove a fertile soil of wretchedness in a pursuit which has long since been worse than hopeless. The meeting took place. He saw an overweight woman, no longer pretty, who talked foolishly and too much. The edifice he had built up in his mind tumbled, and he beat an immediate retreat. There was, however, a dinner with their two spouses, which allowed him perhaps to compare the appetites and girths of Maria and Catherine and brood on their resemblances. Mrs. Winter dined with Dickens and his wife at Tavistock House. He beheld her as she was-no longer the girlish Maria Beadnell, as in some extraordinary way he had expected to find her. In a flash the past vanished and with it - so far as Mrs. Winter was concerned - his youthful dreams. Yet something had been awakened within him; a something which remained peculiarly, unconsciously expectant of some fulfilment.